For many years, the auberge and restaurant Bottes à Mandrin in the commune of Val-de-Fier in Haute-Savoie boasted a pair of giant boots said to have belonged to the smuggler Louis Mandrin.The boots (or ones similar) graced a number of old postcards; and a later photograph shows them on display inside the restaurant. I am a little concerned as the property was for sale this year and, to judge by the photo on Google Streetview, is now in a pretty dilapidated state. Let's hope the legendary boots have survived! Photos from the Mairie Val-de-Fier website, dating from "before 1974". The boots on display in the auberge. 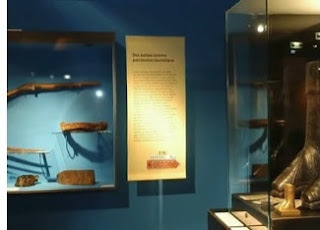 The most recent image that I can find of the boots on the internet dates from 2005 when they were included in an exhibition on Mandrin at the Musée dauphinois in Grenoble. The exhibition brochure informs us that they were found on the banks of the Fier, in Haute-Savoie in 1880: nothing really proves that they belonged to Mandrin, but "there can be only one legimate proprietor, who can live up to their extravagant dimensions". Exhibition: LOUIS MANDRIN. MALFAITEUR OU BANDIT AU GRAND COEUR ? In reality the boots are fairly ordinary 18th-century bottes de postillon, many examples of which survive in both England and France. The postilion's job was to ride one of the pair of horses that pulled a mail or stage coach. The rigid leather boots protected his leg from injury, especially from the risk of being crushed if the horse lost its footing and fell. 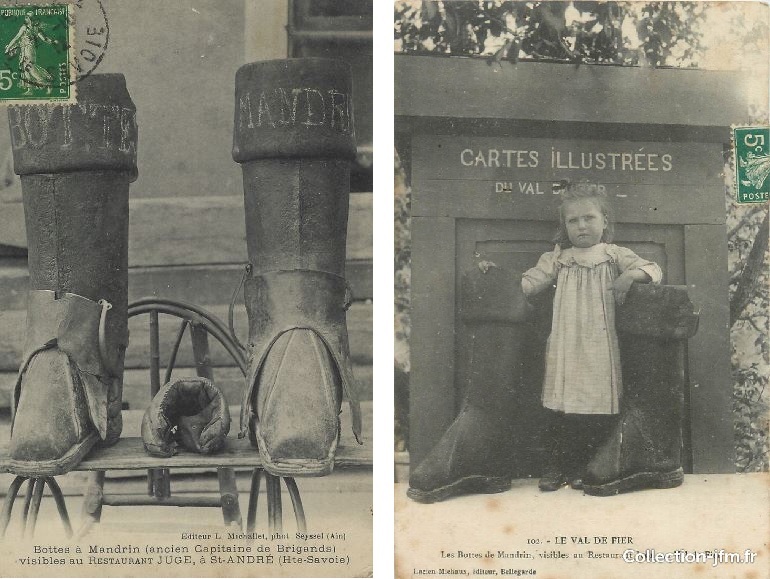 Mandrin's boots weighed in at eight kilos - presumably four kilos each - which seems to be about the usual weight. Since they were so heavy, the boots would be anchored to the stirrups, and would have to be abandoned when the horses were changed: hence - according to one fanciful etymology - the origin of the phrase "seven league boots"(seven leagues being the length of the "stages"). The postilion would wear his ordinary shoes and stuff the bottes with straw. "Castle object of the month: Postilion's boots", 7th Nov. 2018. The serious point about Mandrin's boots, I suppose, is the tenacity of the Mandrin folk legend. This is amply illustrated by the display of books, medallions and other assorted momentos collected for the 2005 exhibition. (There are also better attested relics: the château de Montfleury at Avressieux has his pistols and the Musée dauphinois itself boasts his embroidered cartridge-belt.) Today in the Pays de Savoie, memories of Maudrin are still everywhere: there are Mandrin themed hotels, Mandrin tourist circuits, to say nothing of an interactive experience for children, the Repaire de Mandrin, at St Genix sur Guiers. It had rained a little in the morning, and, as what is called the gras de Paris is, in truth, the gras of all around Paris, the roads were greasy — I know no better word — and, for horses that are never corked, not entirely without danger. We were travelling lieuonière; or, in other words, in the place of the pole a pair of shafts had been attached to the carriage, and our team was composed of three of the sturdy Norman horses so well known on the French roads; the postilion riding the near horse, with traces so long as to enable him to travel wide of the others, and to control the movement. This beast slipped and fell. Rolling over, he caught the leg of his rider beneath his body. I was seated on the dickey of the callèche when the accident happened. Jumping down, the horses were backed, and the postilion, who lay quite helpless, was enabled to extricate his limb. The poor fellow uttered a few sacr-r-r-es, made a wry face or two, and limped back into the saddle. At the next relay he still walked, but with difficulty. * This old boot was the most formidable work in the way of shoe-leather that could be conceived, covering the whole leg to the thigh, and intended for giants rather than for men of ordinary size, one would suppose. The heaviest leather, in more than one thickness, with wood and iron, were worked together in the most substantial way. After the postilion had put them on — or, rather, after his legs were swallowed up in them— they were often stuffed with hay, to fill up vacant space not occupied by flesh and bone. The true old-fashioned French postilion,with his uniform, his monstrous boots and his noisy whip, well known for the peculiar sharp, rapid “crack! crack! crack!" which none but an expert could give, has become a creature of the past, driven off the field by the ironhorse. Five-and-twenty years ago postilions were as common in the streets of Paris as the gendarmes. Muyart de Vouglans and his "Anti-Beccaria"
Dupaty and the case of the "Trois roués"